Model: ThinkPad X131e. Hard Drive: 320GB HDD. Webcam: Yes. This computer will arrive at your doorstep ready to use right out of the box. All necessary cables are included. This computer also includes a FREE standard, open source Office Suite. GENUINE Windows 10 with Restore Partition!! Processor: Intel Core i5 2nd Gen. They are in full working order. This unit was professionally refurbished by a Microsoft Authorized Refurbisher (MAR). All functionality is fully checked and then professionally cleaned. Our hard-working staff are professional, experienced, and dedicated to making your buying experience as pleasant as possible. Lenovo T440 Laptop (ThinkPad) - Type 20B7 - Core i5 @ 2.9GHz - 8GB RAM - 128GB SSD - Webcam - Windows 10 Pro. Storage: 128GB Solid State Drive. These units are in very good condition, originally manufactured with Win 7 Pro. LENOVO THINKPAD T480. Graphics CoprocessorUHD Graphics 620. RAM8 GB DDR4 SDRAM. 14" FHD Screen with 1920x1080 Resolution. 256GB SSD (Solid State Drive). ThinkPad X1 Carbon. Hard Drive / SSD. Windows 10 Professional 64 Bits With COA. But still we take our item back within specified warranty period. Brand: LenovoProcessor: Intel Core i7 5th Gen.
• Model: T470. • Storage Type: SSD (Solid State Drive). • SSD Capacity: 256 GB. • Screen Resolution: 1366 x 768 ( HD ). • Screen Size: 14 in. Used lightly, tested working 100%. 320GB HDD + New Windows 10 Home 64bit !! Lenovo 130-15AST 81H5. AMD A6-9225 Processor 2.6GHz; 4GB DDR4-1866 RAM; 500GB Hard Drive; AMD Radeon R4 Graphics. 500GB Hard Drive. 500GB hard drive for serviceable file storage space. 4GB DDR4-1866 RAM. X250 Ultrabook. 500GB hard drive 16gb SSD. Lenovo ThinkPad. i5-5300U 2.30GHz 8GB. bottom has normal scratches from usage. Windows 10. MODEL: ThinkPad T460s. MAKE: Lenovo. INSTALLED SOFTWARE : Windows 10 Pro. DISPLAY: 14". AC ADAPTER (POWER CORD): YES. Lenovo T460s Laptop. 512GB Solid State Drive. Windows 10 Professional. Lenovo ThinkPad X230 Tablet - 12.5" - Core i5 3320M - 8 GB RAM - 500 GB HDD Docking Station/DVD Drive. Product Line Lenovo ThinkPad X230 Tablet. Manufacturer Lenovo. Max Supported Size 16 GB. Installed Size 8 GB. Lenovo ThinkPad w530 Windows 10 Pro. 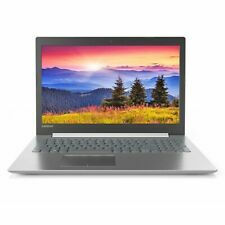 LENOVO LAPTOP w530. NOT INCLUDED: KEYBOARD, MOUSE, BOX OR MANUALS. Battery Life: OEM Battery 1 hr aprox. Top Case : Signs of use, light scratches or marks of use are slightly visible, No dents or Cracks. Lenovo ThinkPad T430 - Assembled in the USA. High-Performance Premium Thinkpad with FAST! 256GB Solid State Drive ( SSD ). This T430 Thinkpad is used but in Excellent condition, The outside casing of the laptop may have so. HDD has been replaced with Sandisk 1TB SSD. This i7 CPU has a max turbo limit of 3.4GHz. T460s ( 20F9-003CUS). 8GB DDR4 RAM (4GB soldered 1x4GB SODIMM). Fingerprint reader. 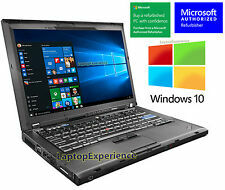 New ListingLenovo Thinkpad X1 Carbon i7 4600U Turbo 2.1GHz-3.3Ghz 8GB 240GB SSD Bundle!! Top end 2014 (manufactured in 2014-2015) Thinkpad X1 Carbon with i7-4600U 8GB RAM and 240GB SSD. This can easily act as your primary computer. 8GB RAM and 240GB SSD for multi-tasking, high speed, and massive storage! SKU: NB316. This pre-owned unit has been tested and is fully functional. Windows 10 64-bit system (with COA) has been pre-installed. (Tested and Full Functions, R2/Ready for Resale). 24 Hour Dispatch. Lenovo ThinkPad L440. Hard Drive: 500GB. Headphone/Mic Combo Jack. These systems have a product key affixed to them indicating that it is part of the Microsoft 3rd Party Refurbisher Program. This system is part of the Microsoft 3rd Party Refurbisher Program. Processor AMD Ryzen 5 2500U / 2 GHz (3.6 GHz) / 2 MB Cache. Storage 256 GB - M.2 SSD. 1 Year Lenovo Manufacturer Warranty Included. Graphics AMD Radeon Vega 8. Display 14" LED backlight 1920 x 1080 / Full HD. Top end Thinkpad X1 carbon, i7 CPU Turbo 3.2GHz, 8GB RAM, and 240GB SSD. Everything you need for a ultra-thin, ultra-light yet ultra-powerful laptop! 8GB RAM and 240GB SSD for multi-tasking, high speed and massive storage. Designed to be equally stylish in every mode, the Yoga C930 is crafted from premium aluminum with high-precision drills and polished twice for luxurious tactility. Learn more. Quad-core, eight-way processing provides maximum high-efficiency power to go. Hard Drive: 128GB SSD. Lenovo AC adapter. Storage: DVD-Writer. 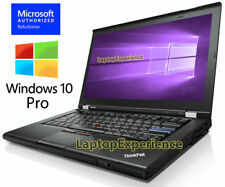 Brand: LenovoProcessor: Intel Core i5 4th Gen.
Lenovo ThinkPad X230 Laptop / Core i5-3230M 2.60Ghz 12'. Lenovo T460s Laptop. 512GB Solid State Drive. Back Lit Keyboard. 14.1" LED Screen. 1920x1080 Screen Resolution. Windows 10 Professional. 128GB SSD storage. Enjoy Dolby Audio and fast-web browsing without breaking the bank. Solid State Drive Capacity 128GB. AMD A6-9225 2.6GHz Dual Core Processor (up to 3.0GHz with Max Boost). AMD Radeon R4 Integrated Graphics. IBM Thinkpad Lenovo X260 w/Intel Core i7 vPro 6600U 2.60GH 16GB RAM 500GB HD! The Lenovo system serial number is R9TB6XM and the Lenovo model is 2436-CTO. No dings, dents, scratches or missing pieces though. The LED screen is in excellent condition free of defects, and the cooling fan is free of dust and dirt. When searching for a personal computer, it can be difficult to understand all the different terminology when it comes to laptops, netbooks, notebooks, and Ultrabooks or what each of these devices offers. While originally marketed as having a particular design, the line between them is blurring as computing technology updates and hardware components become ever smaller. You can find both laptops and netbooks by Lenovo running on the Microsoft Windows 10 system, with the option to update to successive versions. Do You Need a Laptop or a Netbook? Netbooks were originally compact personal computers with tablet-style processors for carrying out basic computing tasks, such as writing emails and browsing the Web. On the other hand, laptops were similar to desktop computers, but light and small enough that you could place them on your lap. The main difference between the two is their size and weight, although netbooks tend to have solid-state drives with low storage capacities, rather than traditional hard drives found on other personal computers. Most laptops have more powerful processors than netbooks, which makes them a good option when your computing needs include gaming or more intensive tasks. As computer devices and internal hardware update and become smaller, many laptops are just as lightweight and mobile as netbooks, which are slowly phasing out as a result. Which Factors Should You Consider When Buying a Laptop or Netbook? One of the most important factors to consider when buying a laptop or netbook is how much memory you need, with Lenovo Windows 10 models available with anywhere between 2 GB and 16 GB of RAM. You should also take into account the power of the central processing unit (CPU), as this determines how well your personal computer performs when carrying out a range of multimedia tasks. The physical size of the laptop or netbook is also important, as it determines whether you can slip it easily into your bag and transport it everywhere you go. When you're looking for compact devices, you should consider a display screen of 13.3 inches or less, although you can find laptops with larger screens, such as 17.3 inches, that are still relatively lightweight. When you spend long hours typing at the keyboard, it's essential that you find a laptop or netbook with a comfortable layout and responsive keys to prevent any repetitive stress injuries from occurring. Check that there's adequate space between the keys and that they bounce back quickly after you release them. Content provided for informational purposes only. eBay is not affiliated with or endorsed by Lenovo or Microsoft.